What better way to spend your christmas money than on a classic Burberry scarf? I promise the two of you will live happily ever after, because tartan NEVER goes out of style and you can basicly wear it EVERY day, ALL winter long with EVERYthing in your wardrobe. It’s great for mixing and matching with prints, wear it all classic tucked into your shirt or tie a big bow and have a fancy night out. Talking about tying a scarf – be a little innovative, try out different ways to tie the knot (check out ‘25 ways….‘), don’t be lazy, it really does make a difference. – Mr. Hat wears a big and soft scarfs, wraps it around just once and ties it loosely, softenes his Amish look immediately and gives a glimpse of his pretty denim shirt underneath. – Mr. 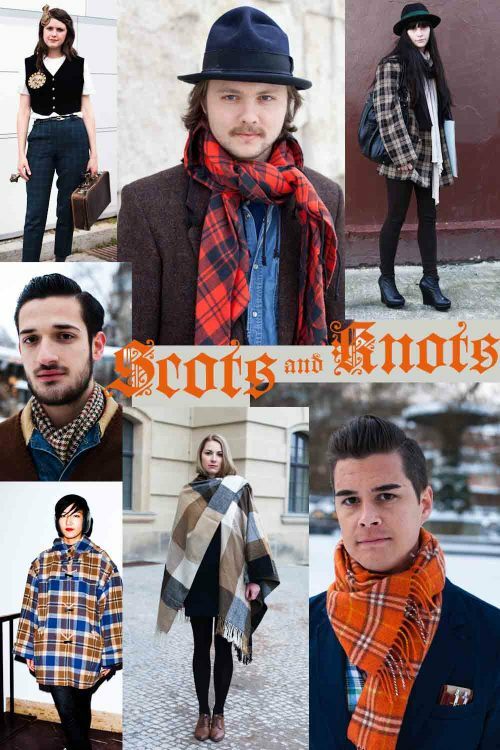 Beard uses the classic men’s scarf, very short, masculine colors, wool (if not cashmere probably itchy) and knows a good way to bring out the different layers and materials of his jackets with his scarf. No loop, no tie, he just puts one end upon the other and tucks it under his jacket, very subtle, very sophisticated. – Mr. Rockabilly looks like a true ‘bon vivant’ – classic tartan scarf, very soft (looks very much like cashmere to me), playful fringes, just one impatient loop around the neck, one little corner tucked in, as if he didn’t really care…..but sure he does, man of fashion that he is, choses a bright, unusual color, puts a little ball-pen box in his breast pocket and I am sure it took him more than 5 minutes to get his hair done. He definitely puts a lot of thought in his appearance, even the nicer that he knows not to overdo it with a too perfectly tied scarf.